Accidentally I found his music in social network services, and after that his creation made its mark in my memory. Serjio Fridd is a Ukranian underground composer of experimental music. He denies fame and glory, but I think, that he deserves attention. In real life he is represented as a solid and severe young man, however, his music shows, that indeed Serjio is a kind-hearted, modest, dreamy and creative artist. First track, that I listened to, was “Conversation With A Rain”, and after that I stuck to be waiting for next tracks. This melodious, relaxing piece is a real conversation with a rain, that could take place if one stayed alone with his piano, looking at the rain behind the window, and these gentle sounds would be the best message, that rain could ever receive. “Conversation With A Rain” is not only a sonic work, listening to it, your imagination is certain to create different movies, full of serenity and silent joy. But if this track is accompanied with rain and light coolness, “Sleeping Flying” is saturated by mild light and warmth. Listening to its mantric, hypnotizing melody, you’ll definitely get a feeling of a flight in sleep. Its mood resembles the moods of some Sigur Ros’ compositions, with their goodness and optimism. 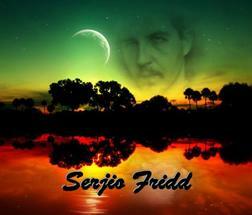 Serjio Fridd doesn’t seek for popularity, so he publishes his works by himself on social network services. He created tracks gradually, and eventually, he collected them in the album, called “Collecting Dreams”, which I insistently recommend you to listen to.